I recently decided that I could be a huge dork and award superlatives to Glee cast members like you do in real high school. I put some thought into which actor would get "funniest," or "best dressed," but really, those superlatives are stupid because we could argue for days. The only "superlative" that I'm really interested in giving (today, at least) is that of Most Versatile Performer - the cast member who's fielded the most variety in song and dance and done so with excellent results. We're not talking acting, or line deliveries, or number of solos - we're talking musical performance versatility. I'm going to go ahead and say it's Kevin McHale. Vocal versatility? Check. How 'bout dance? 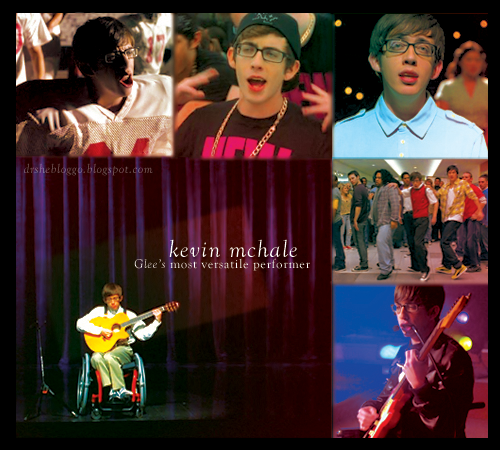 Well, Kevin performs all of the choreography in Artie's wheelchair, with the notable exception of "Safety Dance," where he actually gets up and proves that he can dance damn well without it. I'd say that's a check for dance versatility. Instrumentally, he's played the guitar on several occasions, and handled the vocoder on "It's My Life/Confessions Pt II." To boot, he's the boys' go-to rapper, the male counterpart to most of Amber's Season 1 leads, and a damn fine soloist within his own right. That's all the evidence I need, really. The only thing he's really lacking is the showtune element, if you're not counting the smidge of "Sit Down You're Rocking the Boat" from the pilot. The showtunes tend to go to Kurt and Rachel, and I'm fine with that. But I'm going to stick with Kevin for my made-up honor. I think it's well-deserved. Plus, I already made the graphic.